Do you want to become more charming and likable – instantly? Or just make sure you can defend yourself verbally, and not be a doormat? Do you lose arguments, find yourself speechless, or get taken advantage of by others? Or do you just want to build meaningful connections and friendships quickly? Sounds like you need to learn as many Conversation Tactics as possible! In this book you’ll learn 18 powerful techniques that can be used for everything under the sun – charming people, befriending strangers, increased charisma, and even arguing effectively. You can never underestimate the power of a simple conversation. It can be the start of something beautiful, or it can potentially ruin your day. These 18 techniques, learned from years of coaching social skills and conversations, will ensure better conversations and fewer arguments. In addition to incredibly shrewd and nuanced insights to make conversation flow, you’ll learn how win arguments and diffuse dirty tricks. 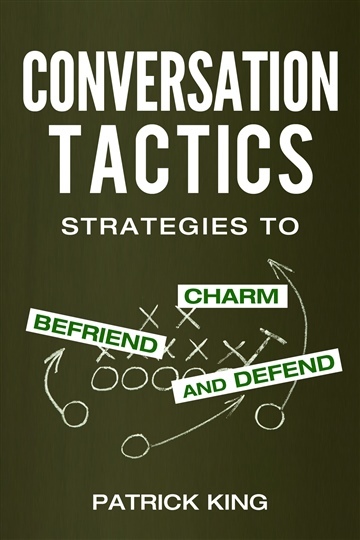 What actionable and realistic conversation tactics will you learn? •	How standup comedians use conversational high points for great reactions. •	What the two-second rule is and how it makes you appear incredibly attentive. •	How interrupting artfully can be your secret weapon to bonding. •	The singular best way to warm up for any conversation, anywhere. •	The foolproof method of rehearsing only your hellos and goodbyes. •	The 2:1 ratio and why math even matters in successful conversations. •	The logic of not laughing at your own jokes. •	The 5 most common argument tactics and how to neuter them. •	How to deflect any ridicule. Here’s what this book isn’t: advice that isn’t helpful and doesn’t work, like “fake it ‘til you make it” and “just be yourself.” Real, practical advice for everyday conversations. How will your daily life improve? •	Always know how to defend yourself and come out on top. •	Pinpoint what people are looking for in their connections. •	Never fall for people’s dirty argument tricks. •	Gain people's respect and never be a doormat again. •	Find the carpool lane to people’s inner circle, quickly. •	Turn enemies into friends, and friends into confidantes. •	Always know what to say, and never fall prey to awkward silences. Implement these 18 techniques and see your charisma skyrocket. Patrick King is a Social Interaction Specialist and Conversation Coach based in San Francisco, California. He is an internationally bestselling author - somewhere among the many clients throughout the years, he decided to flesh out his inner monologue and found that he had quite a bit to say. When he's not helping clients conquer the world, he's either fronting an 80's cover band or training for his next 10k. at work with respect argument tactics that were being used against me." to the point with actionable tips. Great summary at the end!" on how to defend against common attacks, helping me close the deal."